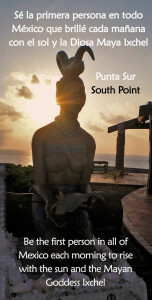 arrived here in the 16th century they named it “Isla Mujeres” because of the many cult images of goddesses here. But the first news we have about Isla Mujeres history is from the period between the years 564 – 1516 AC, when the island was part of the mayan province called Ekab (there where 4 mayan provinces in what is today the State of Quintana Roo). Since then, the island was considered sacred by the mayan civilization, therefore, this was not a mayan village, but a sanctuary dedicated to mayan goddess Ixchel. Besides this, the mayan also exploited the salt that the island produced in the “salinas” (small interior lagoons) that back in those times, the salt was used not only for the conservation of food and medicine but also has a generally accepted currency for commerce of goods along the whole mayan region. The Mayan goddess Ixchel had a temple in what is today the Hacienda Mundaca (Mundaca’s Plantation House). Fermin Mundaca was a pirate who took refuge in Isla Mujeres in 1860, having earned a fortune with the sale and trafficking of slaves from Africa to Cuba , to work on the sugar plantations of the island. Legend has it that once a refugee in Isla Mujeres, having faced the British navy in 1858, Fermin Mundaca, fell in love with a native of the island, nicknamed “The Trigueña” and that inspired him to build a farm with wells, arches and extensive gardens, which were called Vista Alegre and is now known as Hacienda Mundaca . Mundaca is said to have always lived alone without much contact of his servants and suppliers: fishermen, construction workers and farmers etc. On the property, now almost abandoned are some inscriptions, one of which relates to himself: “Nautical pilot, fomentador Fermín Antonio de Mundaca. There in the hacienda is a tomb that was ready for his own death, but it has remained empty. When he fell ill a friend took him to Merida for treatment hospitably but having died in that city, his body was never returned to Isla Mujeres and island residents never heard from him again. There was a small Mayan temple on the south tip of the island, however in 1988 Hurricane Gilbert caused extensive damage to it, leaving most of the foundation and a very small portion of the temple. It is definitely worth a trip to South Point, you pay a smal fee to walk to the tip of the island where there is much Isla Mujeres history but there is also a beautiful scenic walk along the cliffs. Since the 1970s along with Cancun there has been substantial development for tourism in Isla Mujeres.